Multiple wildfires continue to race through parts of Los Angeles, Ventura, Santa Barbara, and San Diego counties in Southern California. The largest blaze – known as the Thomas Fire – has scorched more than 230,000 acres. Evacuation orders have been extended to parts of Santa Barbara, affecting nearly 100,000 people. 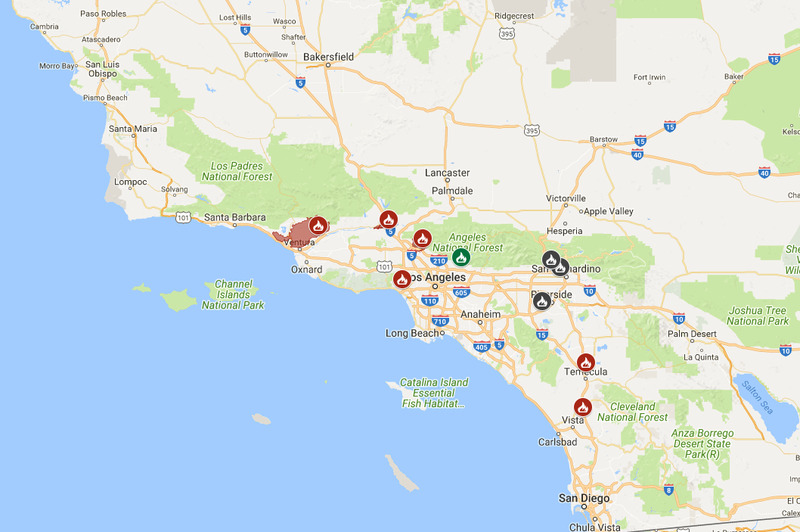 One death has been blamed on the Thomas Fire so far. Santa Barbara is now threatened by the rapidly-growing Thomas Fire, as thousands of firefighters battle several infernos burning through Southern California. 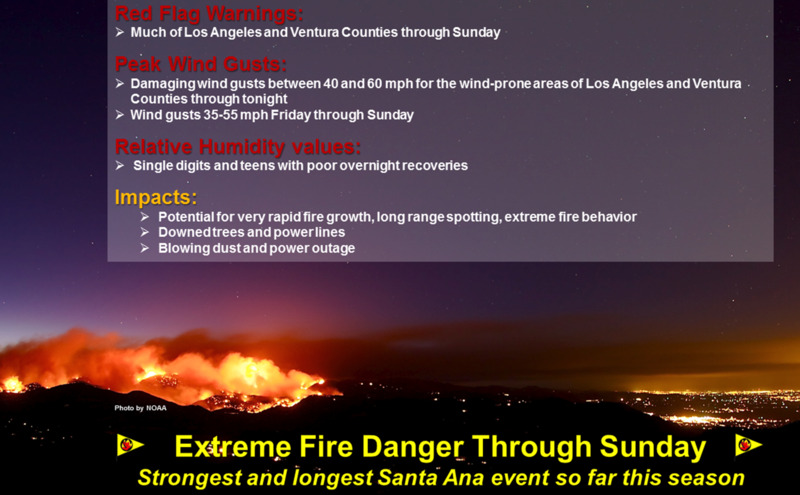 The fire grew by 50,000 acres on Sunday as dry Santa Ana winds continued, triggering evacuation orders throughout Santa Barbara County. One death has been blamed on the Thomas Fire: the body of 70-year-old Virginia Pesola was discovered at a car crash site on an evacuation route in Ventura County on Wednesday night, according to NBC. Over 9,000 firefighters are working across the region to contain the blazes. Over 1,000 structures have been damaged or destroyed, and 98,000 people have been forced to evacuate since the fires started a week ago. Thomas Fire in Ventura County: 230,500 acres burned, 15% containment, 981 structures destroyed out of at least 18,000 threatened, one death. Creek Fire in Sylmar: 15,619 acres burned, 95% containment, 89 structures damaged or destroyed. Rye Fire in Santa Clarita: 6,049 acres, 93% containment. Skirball Fire in Bel Air: 421 acres, 85% containment. Lilac Fire in San Diego County: 4,100 acres, 151 structures destroyed, 75% containment, evacuation orders lifted. The first and largest blaze, the Thomas Fire, started Oct 4 in Ventura County. Its flames reached the Pacific Ocean on Wednesday. Several cities in the Ojai Valley were under mandatory evacuation orders on Saturday, though some of those orders have been lifted. Officials issued a new round of evacuations for residents in Santa Barbara on Sunday, however, and warned that they may order more on Monday. 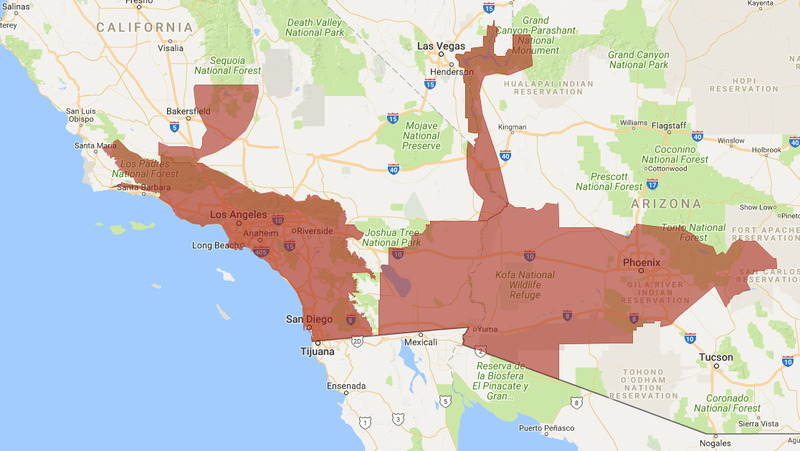 Mandatory evacuation orders now affect nearly 100,000 people, down from 200,000 last week. The Skirball fire in Bel Air threatened the Getty Center art museum, though firefighters had contained 85% of the blaze by Monday morning and the museum remained unharmed. The region is still under a “red flag” advisory. Forecasters expect the winds to subside this week, though there is still no rain in the immediate forecast. “We’re chasing the fire trying to get ahead of it, trying to get in front to provide structure defence,” David Richardson, the Los Angeles County deputy fire chief, told the LA Times. Lorenzen told The LA Times on Thursday that if rains don’t fall on the region, the Thomas Fire could continue burning for weeks. That prediction has held up as of Monday, as the fire continues to grow. Officials urged residents to wear masks outside, as the air quality near the fires was rated “hazardous” – the worst classification. Gov. Jerry Brown has declared a state of emergency, freeing up state funds to help tackle the wildfires. Brown called the fires a “new normal,” over the weekend, since this year’s devastating wildfire season is part of a larger trend fuelled by climate change. 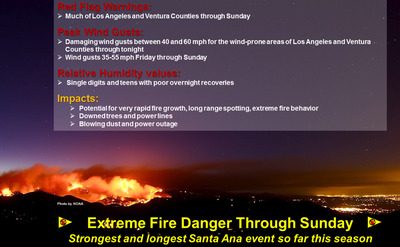 Hours before the blazes started on Monday, the NWS warned that there would “be the potential for very rapid spread of wildfire” and “extreme fire behaviour.” Fire danger was rated a 296 on the brush burning index on Thursday – a record, according to CNN. The figure is calculated based on moisture levels, wind, humidity, and a range of other factors. A rating above 162 is considered the most extreme risk. California has been ravaged by wildfires in recent months. In October, a series of fires destroyed communities in Northern California’s Napa and Sonoma counties in what is considered the deadliest wildfire in the state’s history. Experts said at the time that it would take years for the state to recover.